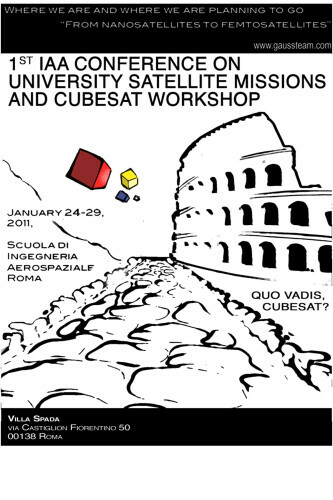 The Scuola di Ingegneria Aerospaziale of Sapienza University of Roma is honoured to host the 1st IAA Conference on University Satellites Missions and the 1st CubeSat Winter Workshop, dedicated to the new generation of university satellites: micro, pico, femtosatellites, from cubesats to pocketsats. In particular the 1st CubeSat Winter Workshop will provide the opportunity to students to have an overview of the current status of the university microsatellites, as well as to exchange different points of view through a variety of sessions, laboratories and forums. We are also very proud to recall that the Scuola di Ingegneria Aerospaziale itself initiated the university satellite program, exactly fifty years ago. The Conference and the Workshop are directed also to both past and present students already skilled and experienced in satellite design and manufacture, as well as to beginner students for which special laboratories will be organized during the workshop, and last but not least to future students (high school students) for which a full half-day meeting is specially dedicated. We invite you to participate and we are looking forward to meeting you in Roma. Scientific Committee: Jean-Michel Contant, Robert J. Twiggs, Martin Sweeting, Filippo Graziani, Jean Muylaert, Jordi Puig-Suari, Rainer Sandau, Rheinard Ruedeger, Francesco Emma, Vladimir Andreev, David M. Klumpar, Sergio Chiesa, Michael Ovchinnikov, Piero Galeone, Paolo Teofilatto, Benjamin K. Malphrus, Helen Page, Carlo Ulivieri, Amalia Ercoli Finzi, Fernando Aguado Agelet. Thales Alenia Space Italia S.p.A.
Exhibition: The Workshop is accompanied by an industrial exhibition of space engineering technologies and equipment.